Yisrael Beytenu chairman Avigdor Liberman on Thursday morning sharply condemned the decision by Haifa Mayor Yona Yahav the day before, by which he chose to return funding to the Al Midan Theater that recently ran a play sympathetic to an Arab terrorist murderer. "If Yona Yahav justifies the fact that the money of Haifa residents will fund plays supporting terror and glorifying terrorists on the excuse that 'Haifa is a cultural city with tolerance,' then Yahav doesn't understand what culture is," charged Liberman. The MK said Yahav is "confused between freedom of speech and freedom to incite, and between tolerance and support for terror." 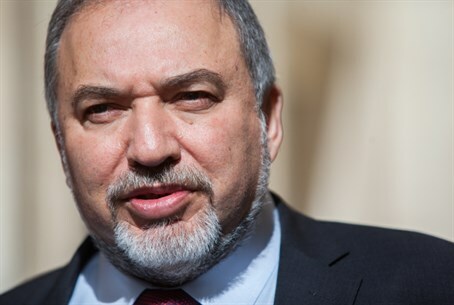 "There's no place for a local authority in the state of Israel funding the glorification of despicable terrorists, and the head of an authority that allows it must resign from his post," urged Liberman. Funding for the theater was pulled by Sport and Culture Minister Miri Regev (Likud), but Yahav simply replaced the lost funding with money from his municipal budget. Yahav's decision was met on Wednesday with outrage by the family of IDF soldier Moshe Tamam, who was brutally murdered by Palestinian Arab terrorists in 1984. Al Midan's controversial "The Parallel Time" play was based on the writings of Walid Daka, one of the murderers of the 19-year-old. Daka was in contact with the play's director via an internet connection in his jail cell, and helped craft the play which sympathetically presents him and his vile murder of Tamam. Tamam was abducted and murdered by Democratic Front for the Liberation of Palestine (DFLP) terrorists from Baka al-Gharbiya as he hitched a ride with them on his way to the town of Havatzelet Hasharon, located on the coast between Tel Aviv and Haifa.